Friends fur-Ever Festival - Take Two! 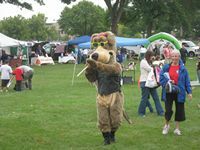 On Saturday, the DuPage County Animal Care & Control ((DCACC) facility was finally able to hold it's "Friends fur-Ever Festival" event. This one was subtitled "Take Two" because the first one had been canceled due to (very) bad weather. The weather didn't start out so great for this one either. I got there nice and early so I could set up our booth at a leisurely pace and still ensure we'd be ready to go on time. However, shortly after I began putting items out on our table, one of the DCACC organizers came around to inform everyone that "due to a storm front moving in in the next several minutes" we had to take down all of the items from our table and ensure that our tent was tied down or otherwise made safe from blowing over. 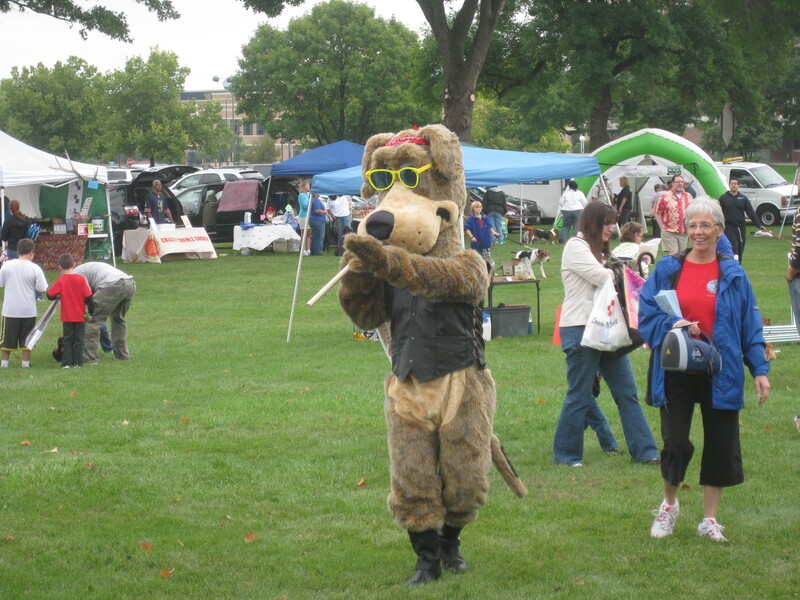 Fortunately, around 10:30 or so, the rain began to diminish and by 10:45 - 11:00, booths were set up, people were arriving with their pets and the event got underway. Our booth was located in the Pavilion. The DCACC organizers came up with the idea of moving all of the booths that had animals that were NOT dogs to the Pavilion. This included the 'cat groups' the 'bird groups' the 'ferret groups' and the 'rabbit groups'. Even though we didn't have any animals (outside of the toy stuffed cat we display in a trap), we were lumped together with them. The thinking went that these smaller animals would be less-stressed out if they weren't in close proximity to the greyhound booth or the basset booth, etc. I think it was a good idea, but we did feel a little out of the mainstream while we were in the Pavilion. We still had lots of people come by and we passed out lots of literature and raised a little money, too. Everyone who visits us continues to be very supportive of Trap-Neuter-Return (TNR). I've included a photo thumbnail of the Dog 'mascot' who wandered around the event. If you click on it, you'll be able to view a larger version of the picture. And, we have many more pictures of this event on our photo album which you can visit by clicking here or visiting the home page of our website and clicking on the 'Photo Gallery' link on the left hand side. Thank you to everyone who came out - we all had a great time!